L & M Arts in Venice just opened their Alexander Calder show, and it is swell. I don't know why that adjective just popped into my head, but maybe because Calder is from another time, but could still be hip now, like swell. 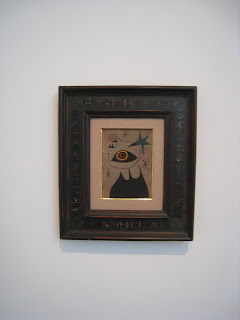 Anyway, I had an unbooked hour today for some weird reason, and jammed over to L & M to check it out. I was once again all alone in there to take it all in. I find that I now prefer this more holy experience there much more than the packed openings, where it's more about the outfits and looking around at who's there than it is the work. 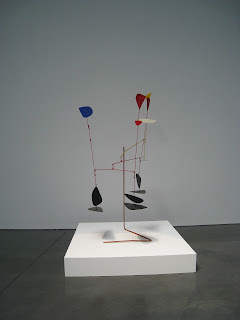 Fun, sure, but not the way to really get and appreciate how ahead of his time Mr. Calder was. 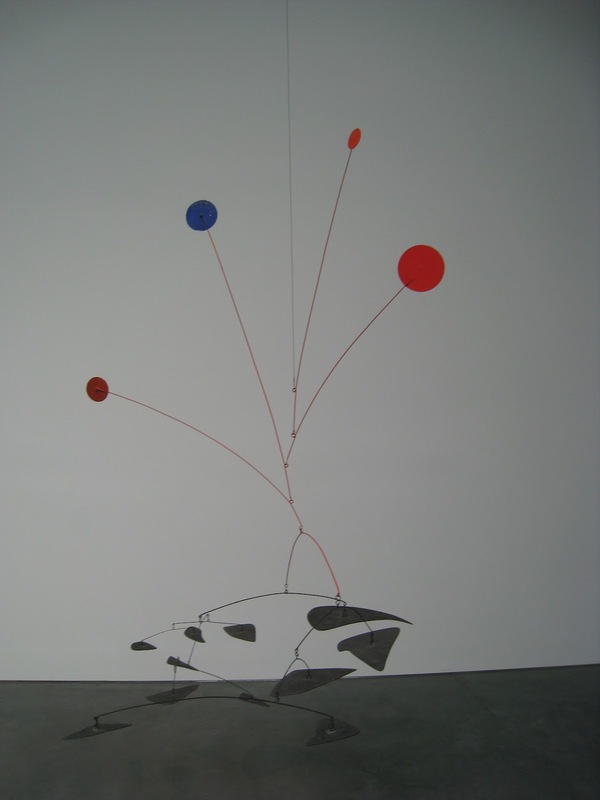 Born in 1898 in Pennsylvania, Calder's work - especially the gouache paintings (all Untitled) - could easily fit in on a building today, or the Graffiti Wall in Venice, and everyone would think it was done by a stealthy modern street artist. Who would then be collected by all the hipsters and skateboard companies would hire him to design decks and tra la la la la, he'd be off to the races. Only he died in 1976, and never heard about all of this stuff we talk about today. He was the real deal. Internationally revered art world superstar and innovator. 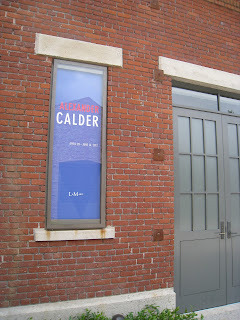 The kids today could learn a lot from studying Calder, and right now it's right up the street, for free. 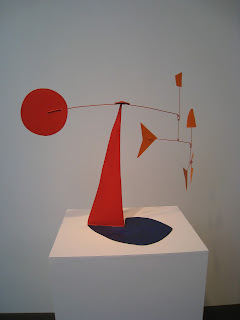 His fanciful kinetic mobiles (so-dubbed by Marcel Duchamp) and bright use of color was inspired by a love of the circus that Calder had his whole life. 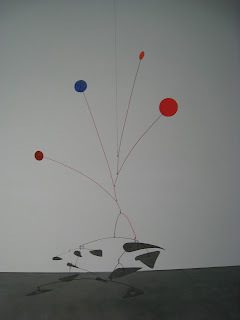 The stationary ones were named "Stabiles" by Jean Arp, but they still seem to be moving, in their grace. 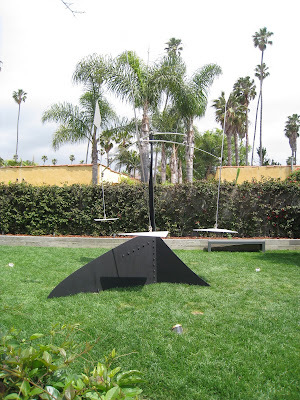 It always puts a spring in your step when you come across one of his outdoor sculptures somewhere in the world (like the outdoor one from 1965 here, 3 White Arrows (3 fleche blanches) . 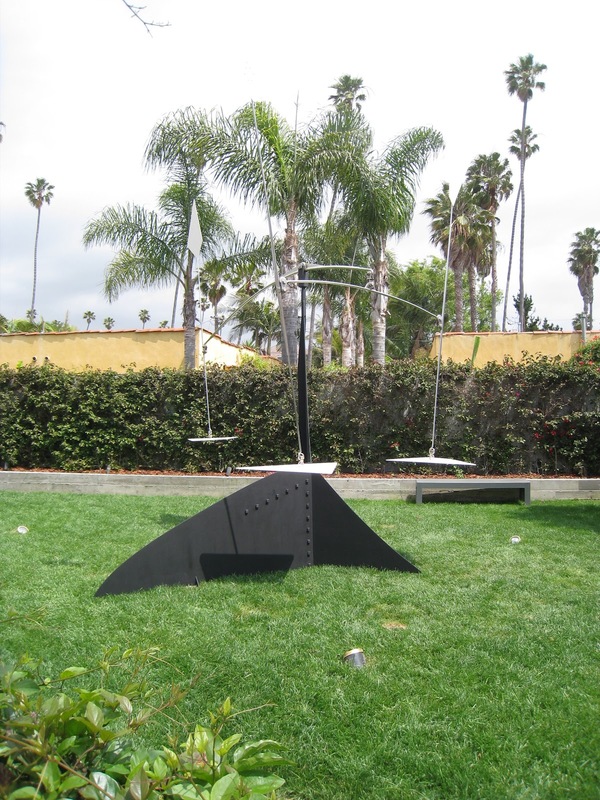 It's always child-like fun AND super sophisticated design, all at the same time. 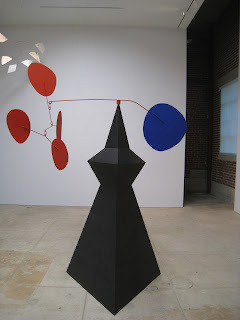 Standing in the middle of the galleries, looking around at the various moving pieces floating around and all the carnival colors, made me think of a bunch of stuff. Like dragonflies and cribs and Bazooka Joe and fireworks and ballet and balance and plants and planets and justice, for some reason, and love, always love. Of person, place or both. Because you can't make things like this and not absolutely love what you're doing. It's evident, and it's free, yet the simplicity makes it all the more complex. Again, like love. So there you have it. 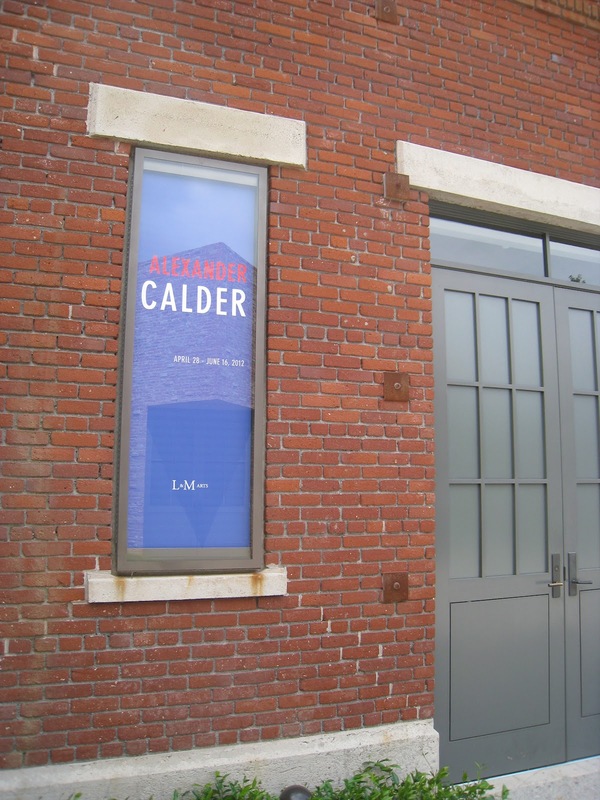 Over 30 years since Calder's death, he's showing in Venice and could easily roll with all the current urban/legend artist cats. That's cool. 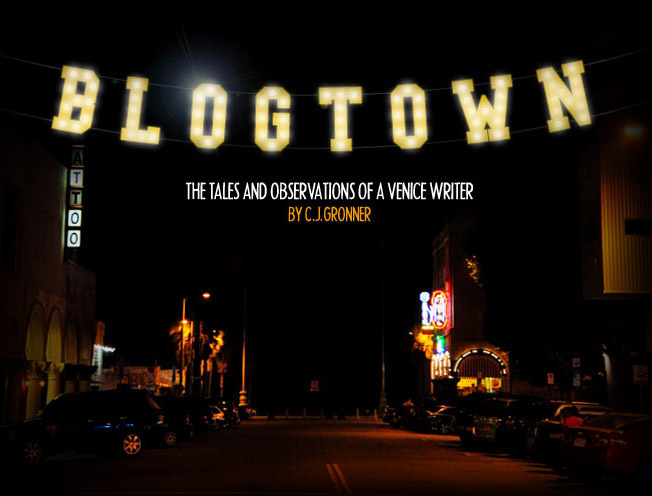 And so are my little getaways inside of L & M. What a great little neighborhood treasure that I hope you all frequent. Because you GET to! Alexander Calder's cool can be seen right now through June 16th at L & M, Venice. 10 am - 5:30 pm, Tuesday-Saturday.